A woman checks her cell phone ahead of arguments at the U.S. Supreme Court Nov. 29, 2017 in Carpenter v. United States. While the government shutdown drags on over President Donald Trump’s proposed Mexican border wall, lawyers are focused on another border controversy: protecting electronic devices from warrantless searches. That includes their own phones and laptops, which invariably hold sensitive client information. The hot-button issue comes into focus with a proposed American Bar Association resolution at the group’s midyear meeting in Las Vegas. The resolution, which will be voted on Jan. 28, urges courts, Congress, and federal agencies to recognize privacy and confidentiality interests implicated by searches and seizures at the border. Specifically, it advocates for a probable cause warrant requirement for electronic device searches there. In addition to the judiciary tackling the issue, it says Congress should enact legislation and, until then, that the Homeland Security Department should adopt policy in line with the ABA’s position. “This is a very big issue in the legal community,” past ABA president Linda A. Klein told Bloomberg Law. “In today’s global economy, more than ever, U.S. attorneys are routinely traveling in and out of the country with extensive privileged materials on their electronic devices and computers,” said Andrew S. Boutros, a partner with Seyfarth Shaw LLP in Chicago, where he’s national co-chair of the firm’s white collar, internal investigations, and false claims team. The proposed resolution, from the ABA’s section of civil rights and social justice, confronts the issue against the backdrop of varying court rulings on the border question and the U.S. Supreme Court’s landmark digital privacy ruling in Carpenter v. United States. The high court’s June ruling in Carpenter said warrants are needed get cell phone location information from wireless carriers. 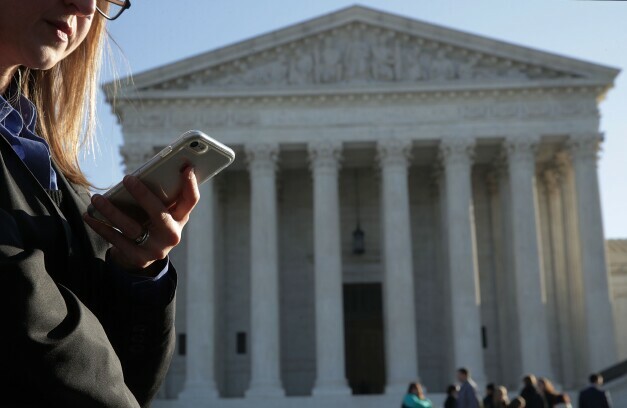 The closely-watched ruling built on 2014’s Riley v. California, where the court said warrants are needed to physically search phones themselves. Courts have had to grapple with the reach of the Fourth Amendment as new technologies have emerged, noted Klein, senior managing shareholder at Baker, Donelson, Bearman, Caldwell & Berkowitz in Atlanta. But without adopting a formal ABA policy through a resolution, “the largest professional association in the world would not be able to speak on” the issue, she said. The ABA represents hundreds of thousands of lawyers, and its resolutions allow the organization to stake out formal litigation positions. The proposed border resolution, number 107A, builds on work that Klein did as ABA president to protect sensitive client information. The importance of the issue has grown as enforcement actions have increased, the report to the ABA House of Delegates accompanying the resolution says, citing a 60 percent increase in fiscal year 2017 for U.S. customs searches of personal devices. The resolution also calls for more protections for attorney-client privilege and related legal and ethical issues, as well as protections for lawful permanent residents who don’t provide access to their electronic devices at the border. It also says the government should have to record each instance in which it conducts electronic device searches at the border, and to issue an annual report on the subject.